Find out what's been happening at the Secretariat. What meetings? What reports are available? Do you have any questions that you'd like taken up either by the Secretariat, or just by others that relate to ICDA work? Then please post your queries/messages for free on ICDA's board! !! Members can obtain password from ICDA !! CENNT was transformed into the European Trade Network in 2002. 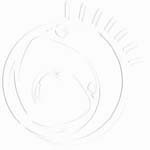 Please click above to see latest developments. ICDA administers the Informal Working Group on Gender & Trade. Click the link to read more! Pls check our Latest News>>Meetings page for upcoming conferences. In the meantime, Maria & Emmanuel will be away from the Secretariat up until Wednesday afternoon. This means that the WTO Impact List will return on Thursday. Still, we welcome any queries by email, or phone. 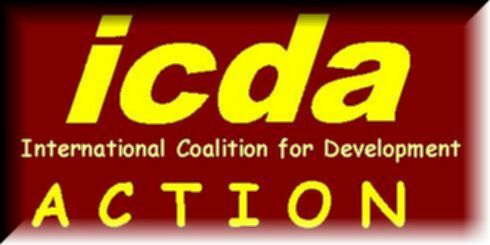 The International Coalition for Development Action is both a coalition of mainly development NGOs and networks and other civil society organizations in the North and South, as well as an advocacy NGO. 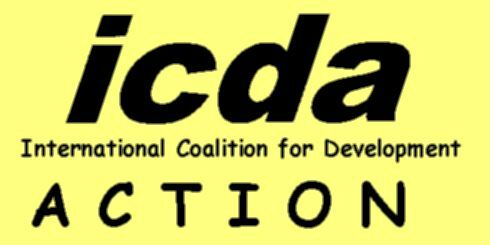 ICDA was founded in 1976 as a result of NGO coordination focused on trade and development issues at UNCTAD Conferences. ICDA is committed to building a more just and equitable international order, with specific focus on trade and trade-related issues. ...with the purpose of furthering people-centred trade policy formulation. monitors international and regional trade policy formulation and negotiation. Of special concern is the promotion and implementation of gender, social and environmental assessments of the effects of trade liberalisation on sustainable human development, especially in the South. The Brussels Secretariat acts as an information clearing house, monitoring media and specialized publications for relevant input. The Secretariat's participation in major (and minor) seminars and/or conferences and intergovernmental meetings provide yet other sources of information. One of its primary aims is to promote issues of international development, including advocacy and education on the adverse aspects of international trade and trade-related isuues. It has both NGO accreditation with the WTO Secretariat as well as consultative status with the United Nations Conference on Trade and Development (UNCTAD). Find out the latest news and happenings around European NGOs and their works on trade, including an analysis of EU Trade Commissioner Pascal Lamy's rhetoric! Subscribe to your FREE daily newsletter on Trade/Development-Related issues! In November 1998, the WTO Impact List (WTOIL) was born as a result of NGO discussion following the second WTO Ministerial Conference in May 1998. After a follow-up conference jointly hosted by ICDA/WWF/ Oxfam UK/Greenpeace NL, the List was finally activated in February 1999. Right into the 21st century, the WTOIL is still going strong. In July 2001, ICDA Chairperson Janice Goodson Foerde decided to coordinate the list so that it would better reflect ICDA's Programmes on people-centred trade. 1. What is the WTOIL? b. what is the yahoogroups thing for the WTOIL? 2. Why the change in 2004? 3. Will the 5-day focus change? 4. Whom should I contact if I have a problem with subscription? 5. When will the WTOIL be back? A: The WTOIL is the same electronic newsletter as the WTO Impact List (WTOIL) established in 1999, whose main aim is to promote issues of international development on a daily basis, by way of daily focuses. It aims to be incisive in its commentary, but above all, thought-provoking. a. what is the NGO WTOIL? A: The NGO WTOIL is affiliated to the WTOIL, but not the same thing. It is called the NGO WTOIL because only those NGOs subscribed to the regular WTOIL receive it. Content-wise, the name speaks for itself. The format is very similar to the WTOIL, but the contents are geared for the NGO community (invitations for NGO conferences; sign-ons; statements; NGO leaks, etc. To this end, ICDA puts a high priority on monitoring/screening those that subscribe to the NGO WTOIL. please submit articles for inclusion in the NGO WTOIL to ngoeyesonly@icda.be . Sending it out directly to the list will help confuse than clarify the value-added of the list. A: the yahoogroups thing for the WTOIL aims to be an archive of WTOILs from 2001 to 2003. It will remain open for a limited period to allow regular WTOILs to subscribe, then it will be closed. You can also use that list just in case, for whatever reason the topica.com list-serv encounters problems, as it appears to have a problem with some emails. A: We decided to change to this system on topica so that we could provide a more efficient, faster, and more reliable news service, which is essentially what the WTOIL borders on being--except that few articles are written by us--ie. ICDA Secretariat. For us, the commentary of the WTOIL is necessary, otherwise it defeats the purpose of our work. We remain critical of economic globalization, and very much in support of multilateral efforts, by way of UN agencies, like UNCTAD, to foster a people-centred, gender-sensitive trade policy. It will return, with regularity, in February. 6. Will ICDA be sending more mails? I'm afraid we will, especially because we want all our subscribers to enjoy this service. The system is rather confusing so we hope that sending more mails will help clarify, but we will limit the frequency. Please check the 5-day focus for more information!! Read up on old FREE reports on Trade/Development-Related issues--viz: agriculture; globalisation; poverty; free trade theories; NGOs; civil society mobilisation...! report (upcoming); "development deficits" explained. Reports produced by staff at Secretariat on conferences -- both general and NGO -- attended. List of meetings attended by ICDA Staff, with brief comments, and themes. Page dedicated to April 2002 Seminar. updated, since Jan 2003, with key FfD themes from WTO Impact List. Comprehensively updated Jan. 2003. Dynamic updates--check often! Samuel, After 10 years, we still love you! !